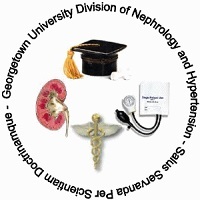 Thank you for your interest in the Medstar Georgetown University Hospital Division of Nephrology and Hypertension within the Department of Medicine. This website contains information directed towards those interested in considering a fellowship in our Division and others interested in the faculty, achievements and programs in the division. Our goal for the fellowship is to train the next generation of leaders and successful clinicians in nephrology. End Stage Renal Disease – we offer training for in-center hemodialysis, peritoneal dialysis, and home hemodialysis. Currently we manage the only “home only” dialysis unit in Washington, DC. Moreover, our hospital is the flagship for all of MedStar transplants. Our fellowship training program is approved by the ACGME (Accreditation Council of Graduate Medical Education). We typically accept 3 fellows per year into the training program depending on available ACGME slots and candidate qualifications. Georgetown has a diverse class of fellows who enjoy great camaraderie and a friendly oriented environment in a superb multicultural capital city with outstanding sporting and recreational opportunities. Georgetown has a prominent research program with a strong focus on both basic science and clinical projects. Through the hard work and dedication of the clinical and basic science faculty along with a strong partnership with the Washington DC Veteran Affairs Hospital, Georgetown is one of the pre-eminent nephrology research divisions in the Unites States. Please see How to Apply for more information.